--Economy Lots E, G, F--all for daily & long-term parking; free shuttle services. --Kiss n Fly - park at that lot & avoid traffic inside airport - from there, take shuttle to Terminal. For immediate parking availability information, please call Standard Parking at (773) 686-7530. Park Net: Tune to 1630 AM within 2.5 miles of O'Hare for current parking lot space availability, proximity to terminals and fees. They enable motorists to temporarily park free of charge until your party has deplaned, collected baggage and called to be picked up curbside. These convenient waiting areas eliminate the need for circling the airport repeatedly if an arriving party is later than expected. The 150-space lot is located at Economy Parking Lot F. Exit I-190 at North Mannheim Road and follow the signs to Economy Parking F/Cell Phone Lot. 2. International Parking Lot D: provides short-term parking for people meeting guests at the International Terminal (Terminal 5). The lot is intended for parking three hours or less. Fee: $50/day (over 13 to 24 hrs). (a) Valet Parking - Garage, Level 1 - The preference of many professionals, valet parking allows you to enjoy the convenience of a short walk to your terminal and the comfort of a covered drop-off and pick-up area. The dedicated exit lane saves you valuable time on your way into and out of O'Hare International Airport. (b) Hourly Parking - Garage, Level 1 - Whether you are sending someone off or greeting a guest, hourly parking is close and convenient. (a) Lot E - ) Park and walk to the ATS station for transportation to Terminals. Shuttle bus also available for transportation to the ATS station in Lot E, wait at any of the Shuttle Bus stops located in Lot E. Shuttles available 24 hours a day every day of the year. Please Allow at least 30 minutes to get from Lot E to the Terminals. (b) Lot G - Shuttle buses will transport customers to the ATS station in Lot E. Shuttle buses operate 24 hours a day, every day of the year. Allow at least 30 minutes to get from Lot G to the terminal. Use Credit Card In / Credit Card Out for the quickest exit. Free Shuttle service (bus & ATS). (c) Lot F - Shuttle buses will transport customers to the ATS station in Lot E 24-hours a day, every day of the year. Allow at least 45 minutes to get to the terminals from Lot F.
Payment Options: An EZ Pay Station kiosk is located in the Pedestrian Walkway near the Chicago Transit Authority (CTA) Blue Line station - and at Midway International Airport in the CTA Pedway Parking Garage - Level 3. The EZ Pay Stations accept cash, credit and debit cards, and personal checks. 5. Kiss n Fly: is an easy way for passengers to avoid airport traffic. The Kiss n Fly point provides them with transportation to the Airport Transit System (ATS), which quickly shuttles them to any of the airport's four terminals. 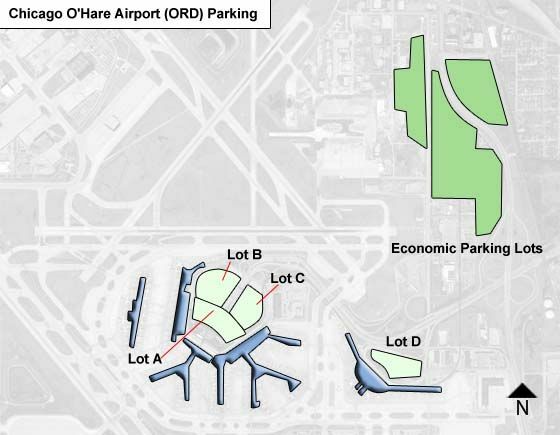 The drop-off point is located directly off Bessie Coleman Drive and is particularly convenient for those travelers reaching O'Hare from the north and northwest suburbs. Directions to Kiss and Fly: from I-190, drivers should use the International Terminal exit to Bessie Coleman Drive. Turn left at the traffic light on Bessie Coleman and follow it north to the Kiss 'n' Fly entrance. From Higgins Road, drivers should follow Mannheim south to Zemke Road, turn right on Zemke, and follow the road to the Kiss 'n' Fly entrance. If parking in excess of 30 days, please call (773)686-7530 to make arrangements in advance. If arrangements are not made, vehicles parked over 30 days will be considered abandoned and will be towed at owners� expense.